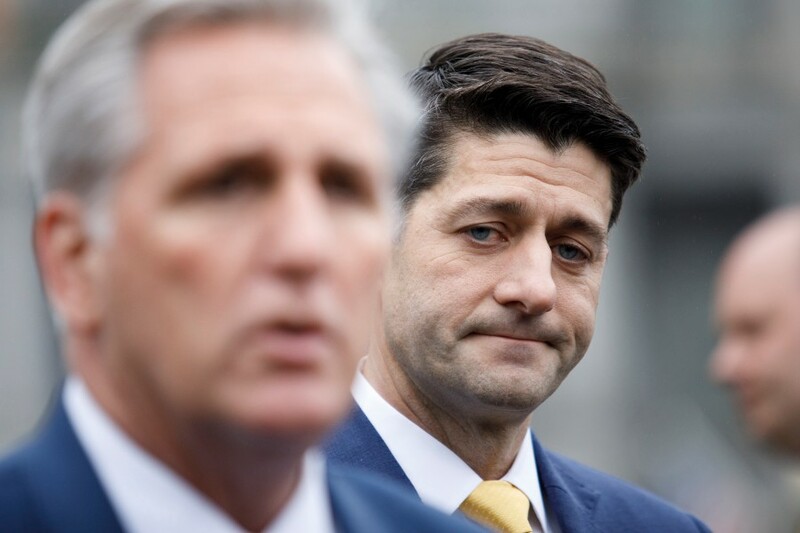 Rep. Kevin McCarthy (R-Calif.), left, and Speaker of the House Paul Ryan (R-Wis.) deliver remarks following a meeting with President Donald Trump regarding government funding, at the White House in Washington on Dec. 20, 2018. WASHINGTON — The federal government shut down early Saturday after congressional and White House officials failed to find a compromise on a spending bill that hinged on President Donald Trump’s demands for $5.7 billion for a border wall. It is the third shutdown in two years of unified Republican rule in Washington, and it will stop work at nine federal departments and several other agencies. Hundreds of thousands of government employees are affected. Any hope of a compromise ended about 8:30 p.m. Friday, when both the House and the Senate had adjourned with no solution in sight. Talks were expected to begin again Saturday. A burst of late-afternoon activity could not break the deadlock even as Vice President Mike Pence met with Sen. Chuck Schumer, D-N.Y., the minority leader, and senior House Republicans, searching for a solution to a logjam that Trump has shown little interest in breaking. While the president has been unwilling to consider dropping his demand to fund his signature campaign promise, Pence and other White House officials were discussing a number of potential compromises that would force him to do just that, omitting spending on a wall and instead adding money for other security measures at the border, according to several officials with knowledge of the talks. “There’s nothing we can do about that because we need the Democrats to give us their votes,” he said in the video. As in previous government shutdowns, it will not affect core government functions like the Postal Service, the military, the Department of Veterans Affairs and entitlement programs, including Social Security, Medicaid, Medicare and food stamps. But about 380,000 workers will be sent home and not be paid. Another 420,000 considered too essential to be furloughed, like Border Patrol officers, will be forced to work without pay. The Departments of Agriculture, Commerce, Homeland Security, Housing and Urban Development, Interior — which includes national parks — Justice, State, Transportation and Treasury will all be affected. NASA will also be hit.